How Much Is Lyft Stock? Subject: How Much Is Lyft Stock? Lyft management has indicated they plan to do an initial public offering (IPO) for Lyft stock sometime between now and 2020. But for right now, that means there is no real news on how much Lyft stock will be, either in terms of valuation, the Lyft IPO price, or what stock exchange it will trade on. As we always do, we'll let you know any news on the Lyft IPO, company valuation, and more when it draws closer. 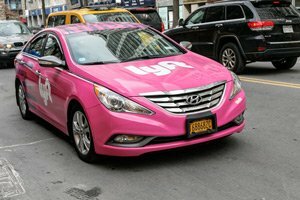 Lyft, like its competitor Uber, is a ride-hailing app that connects customers with its drivers, who are in pink cars with Lyft logos. Like taxis, drivers are paid on the passenger's length of trip. However, ride-hailing apps are considerably cheaper than taxis in most markets. Lyft is a platform where consumers must have an app on a mobile device. The rides can be paid for electronically via credit card, Apple Pay, or PayPal. Lyft was developed in 2007 in Ithaca, NY, by Logan Green and John Zimmer. At that point, it was termed "Zimride," and targeted university students at Cornell University. By 2012, Zimride had put together over 26,000 carpools. Lyft itself grew out of Zimride and was formally launched, with a target of shorter rides in urban areas, in 2012. Zimmer and Green sold Zimride to a larger company, Enterprise Holdings, in mid-2013. Since then, they have focused exclusively on Lyft. Lyft has grown rapidly. In 2015, the company completed more than 53 million rides. In 2016, it completed almost 163 million. That's a 207% rise in just a year. Still, Uber is a lot bigger. Forbes reported that in December 2016, Uber completed 78 million rides in the United States versus Lyft's nearly 19 million. Uber is available globally in 570 cities. Lyft is domestic only and operates in 531 cities. So, of course, Uber's reported revenue is larger. Bloomberg reported that Uber made $6.5 billion in revenue in 2016. Lyft is private and doesn't release revenue figures. However, it did achieve sales of $700 million last year. Uber also has a much higher valuation. Prior to this year's scandals, Uber's market valuation fell between $68 billion and $70 billion. Once the scandals started to mount, its valuation was about $60 billion, CNBC reported in late April. Lyft's current market valuation is $7.5 billion. Money Morning Director of Technology & Venture Capital Research Michael A. Robinson says the ride-sharing space is primed for huge growth in the coming years. Two years ago, more than 85% of respondents to a Pew Charitable Trusts survey believed apps allowing consumers to hail rides saved both anxiety and time. That same year, 68% of those surveyed believed they saved money as well. A large number, 60%, viewed ride-sharing services as having a reliability edge over both taxis and public transportation. 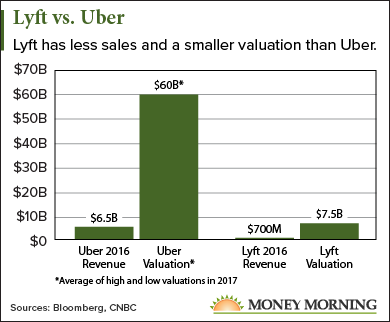 Additionally, Lyft should be a beneficiary of the negative publicity Uber has garnered so far in 2017. Uber has been hit with legal action, allegations that it deliberately skirted regulations, and charges of a pervasive culture of sexual harassment. In addition, its CEO resigned last month. Conversely, Lyft has not been affected by the same negative charges that have plagued Uber lately.